In 1994, eight-year-old Arden Arrowood played with her twin 20-month-old sisters, Tabitha and Violet on a hot, September Labor Day afternoon on the grounds of the family home of Arrowood. The twins argued over a lone dandelion and Arden quickly went around the house to gather more. When she returned, she saw her sisters in the back of a gold car driving away. Since their disappearance, Arden’s parents divorced, her mother remarried and moved away, and her grandparents died. Now, a history student trying to finish her master’s thesis, Arden returns home to Keokuk, Iowa. 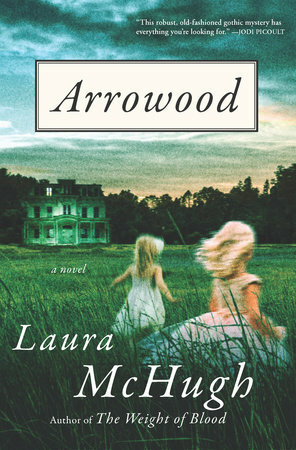 Following her father’s death, she learns that the family estate of Arrowood has been left to her. Much in the town of Keokuk has changed in the years Arden had been away. Homes are in disrepair or completely uninhabited, the A&W is closed, and the Kmart is now an Assembly of God. Fallen on hard times, the town personifies Arden’s own crumbling life. As Arden wanders through her new, old home, memories of times, both good and bad, fill her thoughts and haunt her nights. When Josh Kyle, a writer and researcher for Midwest Mysteries, asks to speak with her about the twin’s disappearance, she is skeptical. Josh begins to unravel many of the tangled stories and perceptions and Arden starts to question her own memories. As she reaches out to past neighbors and family members, she discovers secrets that her eight-year-old self would never have known. It becomes apparent that the facts of the disappearance aren’t as clear as they once seemed. But Arden suffers from her own anxiety and confusion; her abrupt departure from her school in Colorado proves the fragile state of her own mind. What of her memories can she trust; what of her current observations can she believe; what secrets does she know? Wow! Psychological thriller at its best! This was a very griping story. Normally, I avoid books about child disappearances; as a mother, they make me very uncomfortable and they rarely end well. This story attracted me because of the setting of Keokuk, Iowa, which is right along the Mississippi River. The references to Midwestern life – the feel of nagging river gnats, the heaviness of the humid late-summer air, the familiarity of Kmart and A&W – reminded me of my own childhood, not far from the Mississippi on the Illinois side. It was the setting that implored me to take a chance with the story. I am glad that I did. What a complex tale that wasn’t so much about the children’s disappearance, but rather the manipulative power of memory and suggestion. At one point, I truly thought that Arden might be insane and the story was a fabrication of her mind. I was very ambivalent towards Arden’s character and didn’t always feel that I could trust her. I think the author’s presentation of the character created a sense of uncertainty in the readers’ minds which only added to the suspense. The reader is forced to question not only Arden’s believability but also whether or not the reader himself can trust his own memory. This entry was posted in Individual Books and tagged Arrowood, child disappearance, Iowa, Keokuk, Laura McHugh, memory, Mississippi River on October 17, 2016 by kvgaughan.